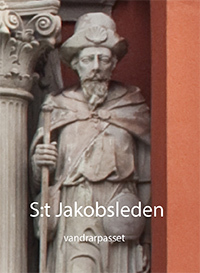 S:t Jacobsleden is a 13km pilgrimage route by foot from Bromma kyrka to S:t Jacobs kyrka in Stockholm. From the western part of Stockholm, S:t Jacobsleden goes along by using Christian temples as path-markers. The route will start on Bromma Kyrka. Inside of the church, we could to see the Medieval paintings made by Albertus Pictor. Going East, we will pass by the modern temple of S:t Ansgars kyrka. For the lunch, we will stop in Rålambshovsparken. We will continue on the route along the edge of Riddarfjärden. Leaving the City Hall behind, we will cross the bridge to reach Gamla Stan. There, we will walk close by Riddarholmskyrkan, Tyrska Kyrka and Stora Kyrka. In Kungsträdgården, we will visit Sankta Eugenia Katolska Kyrka. A few meters, we will reach the end of the route, S:t Jacobs Kyrka. On practice-based research, S:t Jacobsleden aims to engage a diverse group of people on a created-for 'secular' pilgrimage. Attending to the modern secularization of old Western paths as Camino de Santiago or S:t Olavslden. Pilgrimage is an ancestral ritual form of travel where the journey is taken under a purpose to reach a specific place. Everyone can make a pilgrimage including those who are not religiously motivated.